They're beautiful but deadly. Here is a collection of terrifying accessories that have killed their owners, or driven them mad – at least according to legend. From the Hope Diamond, to a stone that was almost worn to a recent Academy Awards, here is our list of the most cursed pieces of jewelry in the world. The Hope Diamond. This is easily the most memorable of all ostentatious jewels and just about everyone who owned a piece of this jewel either went bananas or was ripped apart by wild dogs (so they say). Rumor has it the original stone was stolen from a Hindu idol and acquired by Jean-Baptiste Tavernier. Here's a list of just a few of those who owned this diamond and what happened to them: Marie Antoinette and King Louis XVI (both beheaded), Princess de Lamballe (beaten to death by a mob), Jacques Colet (suicide), Surbaya (stabbed to death by her royal lover who gave her the stone) and Simon Montharides (died in a carriage crash with his entire family). 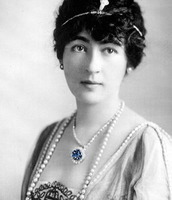 And then there's the story of Mrs. Evalyn McLean (shown above wearing the diamond), who purchased the Hope Diamond from Cartier in 1911. Claiming she could reverse any curse, Mrs. McLean threw lavish "Finding the Hope" parties wherein she would hide the gemstone somewhere on her estate and invite guests to search for it. Sadly, the gem would get its hold of the family. In the end, Mrs. McLean’s son was killed in a car crash; her husband left her for another woman and eventually died in a sanitarium; the family newspaper, The Washington Post, went bankrupt; her daughter died of an overdose, and a grandson was killed in Vietnam. The Black Orlov Diamond. Gorgeous, but we wouldn't want to own it. Also referred to as "The Eye Of Brahma Diamond," this stone (above) was allegedly stolen from one of the eyes in a statue of the Hindu god Brahma in Pondicherry. which would explain the curse and the many suicides to follow the owners of this black diamond. J. W. Paris (who is responsible for bringing the diamond to the US in 1932) jumped to his death from a New York City skyscraper. The next owners were two Russian princesses, Nadia Vyegin-Orlov and Leonila Galitsine-Bariatinsky, who both committed suicide (months apart) by jumping to their deaths from buildings in Rome. The stonet was cut into three different pieces by a jeweler who proclaimed the division would break the curse. And maybe it did, because we haven't heard much from this stone until actress Felicity Huffman was supposed to don the necklace at the 2006 Academy Awards, but mysteriously decided against it. Smart move. The Koh-i-Noor Diamond. This 186 1/16 carat diamond can be seen in the Tower of London on display as a massive part of the Crown Jewels. The diamond was taken from India in 1850 and presented to the British Royal Family. 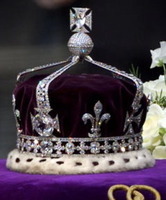 Today, it is currently set in the Crown of Queen Elizabeth (above). Thankfully for these royal women, the curse adversely affects only the men who wear it. Every man who has worn the stone has lost his throne. This may be why it's never been worn by a male since Alexandra placed it on her head. 'One Ring to Rule Them All.' Potentially the ring that inspired J.R.R. Tolkien to invent the One Ring of Middle Earth. Possibly. Maybe. The ancient Roman ring bears the inscription (in Latin) "Senicianus live well in God." This inscription ties it to a Roman tablet inscribed with a curse on the man who steals it. So don't steal it. Many suspect the gemstone (which is not technically a sapphire) was part of the looted treasure stolen from Temple of Indra in Cawnpore during the bloody Indian Mutiny of 1857. The cursed quartz was brought into England by Bengal Cavalryman Colonel W. Ferris, who eventually went bankrupt, as did his son (after he inherited the stone). It was then purchased by writer Edward Heron-Allen, who later claimed it brought him nothing but bad luck. So he gave it away to friends, who promptly returned it after experiencing mountains of misfortune including a singer who lost her singing voice (Forever!!) after possessing the stone. Gem Select even claims that Heron-Allen threw the Delhi Purple Sapphire into Regent's Canal, only to have it returned a few months later (after a dealer bought it from a local dredger). The jewel was eventually sealed up and sent away to the family banker with the instructions that it should stay forever locked away until Heron-Allen's death. Only after three years after his death would his banker be allowed to donate it. And under no circumstances was Heron-Allen's daughter ever allowed to touch or possess the stone. The Lydian Hoard. The Lydian Hoard is a collection of elaborate jewelry, plates, pots and other golden pieces. But the brooch and necklace from the Hoard have caused its owners nothing but trouble. A part of King Croesus' treasure, the loot dates back to 547 BC. But in 1965 (when it was discovered in an dig in the village of Güre), is when the real trouble began. The treasure was found in the tomb of an unknown princess and promptly looted by just about everyone. Over 150 relics were ransacked. Almost all the looters experienced sickness, bad luck and death. Source: Meredith Woerner, iO9, October 21, 2013. Interesting article. I know that there's a similar thing going on with cars, like James Dean's car and the mysterious misfortunes that fell upon anyone having contact with it or its parts, but I did not know jewelry could also hold on to these curses. Didn't Rudolf Valentino have a ring that was cursed?